Samuel Cook was born in Wolen, Russia in 1899. He came to Portland, Me about 1900 with his father Abraham, his mother Bessie and his brother Max age 13. 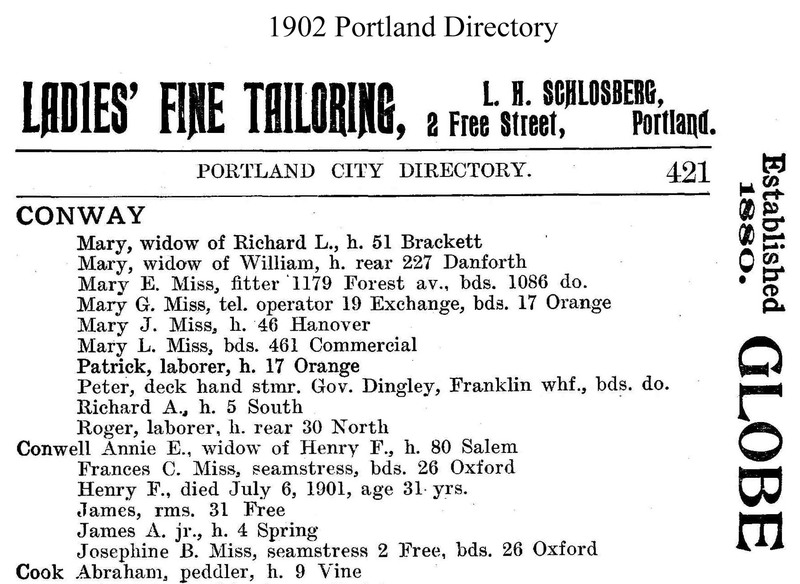 His father, Abraham, started earning a living as a peddler in Portland, walking from house to house with a suitcase of novelties such as needles & thread. After a short time, he rented a horse and buggy and went further into the countryside. He next bought a horse and buggy and traveled even further into the countryside, eventually coming to the town of Sanford, Me., about 30 miles from Portland. Here he saw an empty store for rent and seeing that the town was booming with a large manufacturing establishment (Goodall Worsted Co.—mfg. of plush cloth) he opened a clothing store for men. He rented a house and brought his family to live in Sanford. They had only the two boys at that time, Max & Sam. During the next few years four more boys were born, Israel (Jack), Robert, Morris and David. 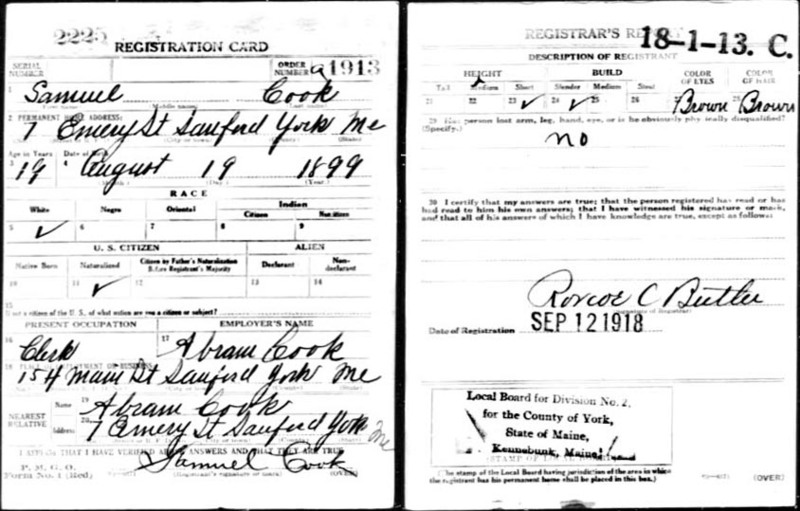 Sam grew up in Sanford, went to high school, graduated and then went to Wentworth Institute in Boston in 1916. He belonged to the S.A.T.C. (Student Army Training Corp.), where he wore a uniform and received military training because World War I was underway. The war ended before he would enter the regular army, and he left Wentworth Inst. and returned to Sanford. His father’s store began to prosper so that Sam and his brother Max were needed to work in the store with their father. Max eventually left to open a furniture store next door and eventually a small hotel in town. Sam was left to help his father, especially with book keeping and finances. 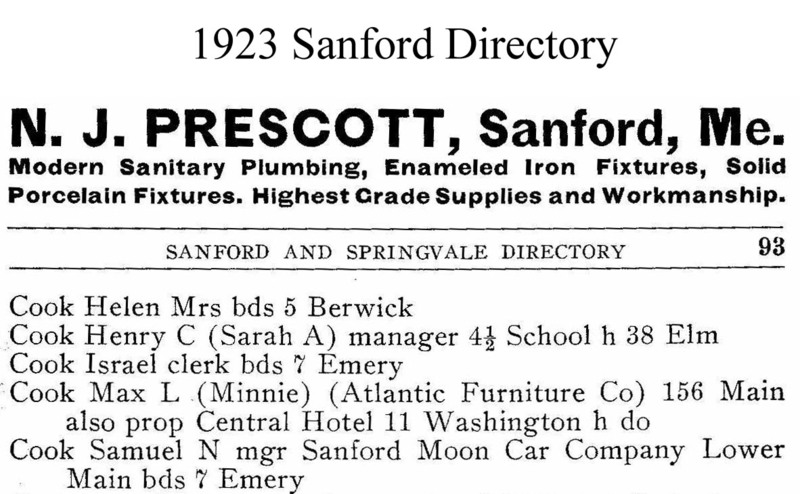 His father began to buy real estate in Sanford & Portland and Sam became knowledgeable about real estate. Sam had always been interested in autos, having owned one of the first model T Fords, which he had purchased second-hand and rebuilt until it ran like new. In selling one of these cars, he received an electric pop-corn machine as part payment. He then loaned this machine to Jack & Bob to open a business in York Beach, Me during the summer of 1923. The two brothers did very well selling pop-corn and candy & soda to movie patrons who were attending the movies next door. Nowadays, movie houses have their own pop-corn & candy concessions in their own buildings. When the auto business slowed down, Sam decided to look into some other business. The opportunity came when he was visiting the nearbye town of Dover, N.H. 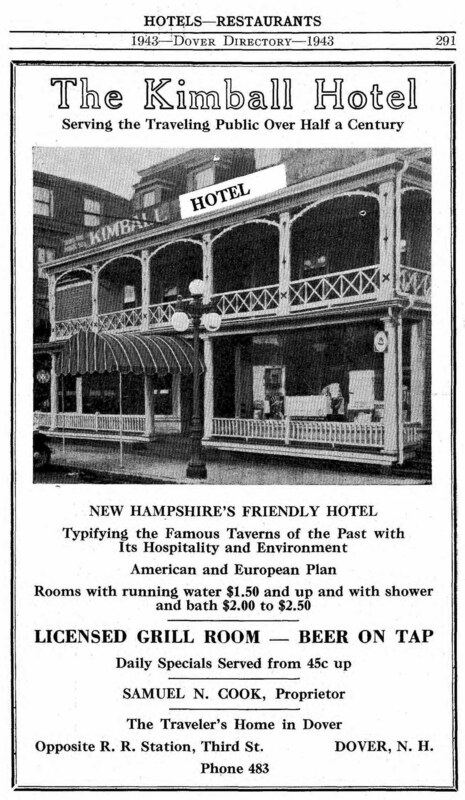 There he saw a small hotel called Kimball Tavern, which was for sale. He bought the hotel with a huge mortgage which he gradually paid off. While in Dover, his sister-in-law Minnie (Max’s wife) introduced him to her lovely young niece, Sadie. Sadie had been recently widowed & had a son, Sheldon. Sam fell in love with her, was accepted & finally they were married. They had three children together, Barbara, Allen & Margie. Sam & Sadie first lived in the hotel with their family. They even brought Sadie’s parents to live with them in the hotel. Finally they bought a house in Dover & raised their family there. Sam had a great influence on his father and younger brothers, Jack, Bob & Morris. When Sam was a student at Wentworth Institute, he became interested in M.I.T. which was nearby. He urged Bob & Morris to enter that institution, to graduate from there & thus started their careers as engineers. Sam was active in the Dover Synagogue, and was its president for a few years. He was popular with the townspeople of all religions and belonged to several organizations helping the poor. Sam & Sadie sent their two daughters, Barbara & Margie and their two sons, Sheldon & Allen to the University of New Hampshire. He also had a gadget which consisted of a button near his bed so that he could press it before getting out of bed on cold winter mornings, causing the window to drop & close. One of his fun gadgets was a coin wired to the carpet in his living room. When a guest entered & tried to pick up the coin, a bell would ring, frightening the guest. Sam loved the outdoors, having a boat on Lake Winnipesaukee. He would drive up there frequently with his family & friends and for many years enjoyed this pleasant sport. Towards the end of his life, he suffered from an incurable illness. But in spite of this, he managed to carry on his daily activities without grumbling and always presenting a pleasant manner. He was a man of strong character, a bright mind, and was loved by all who came in contact with him.